One UFC light heavyweight looks to get a second chance at the gold, while another looks to continue his hot streak en route to his first in the main event of UFC Fight Night from the Avenir Centre in Moncton, New Brunswick, Canada. 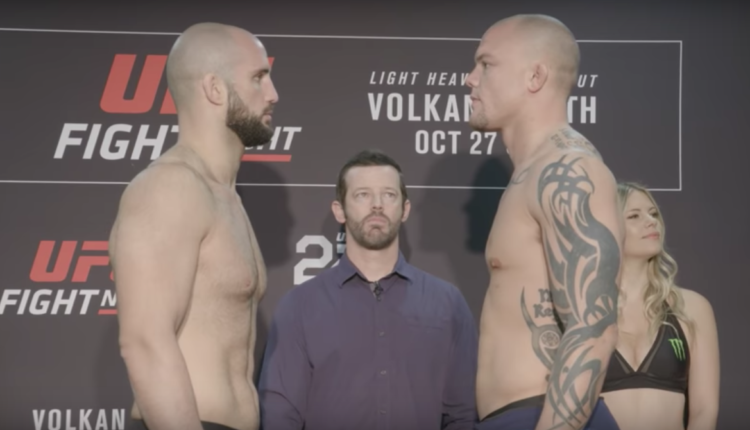 Headlining the card are Volkan Oezdemir, the second-ranked contender in the UFC’s light heavyweight rankings, and Anthony Smith, ranked No. 10. After a 12-1 start to his professional MMA career competing as both a light heavyweight and heavyweight, Oezdemir’s return to 205 came with his UFC debut at the start of 2017. Oezdemir defeated the likes of Ovince Saint Preux, Misha Cirkunov and Jimi Manuwa — the latest of which came via a 42-second, Performance of the Night bonus winning knockout — to earn a light heavyweight title shot against Daniel Cormier at UFC 220 back in January. Oezdemir, however, was TKO’d by Cormier in the second round. He now aims to bounce back and earn another title shot. A 10-year veteran of the sport, Smith’s 2018 began with a Fight of the Night performance in a second-round TKO loss to Thiago Santos back in February. With a move from middleweight to light heavyweight this past summer, however, Smith has become a talking point with quick, impressive first-round knockouts of Rashad Evans and Mauricio “Shogun” Rua. He has now won five of six and 13 of the 15 bouts he’s fought since 2014, and with a win against Oezdemir, he hopes to get his first crack at a UFC title. In the co-main event, Michael Johnson faces Artem Lobov. Lobov, a teammate of Conor McGregor, was set to meet Zbuaira Tukhugov, a teammate of Khabib Nurmagomedov. However, Tukhugov was removed from the card, and nearly cut from the promotion, following the melee that occurred at the conclusion of UFC 229. Johnson missed weight and was fined 20 percent of his purse, but Lobov says he will not accept the fine and return the money to Johnson.